This past week has been a bit too cold for me! We have had reports of CASE members having snow in what I would call mid-April! What is going on? Earlier on the first day of spring, CASE professional development chair and soon to be President Elect (July 1) Gary Myrah said "Wisconsin folks are pleased to welcome Spring, though it comes in disguised as Winter!" Little did he know how very true that statement would be! 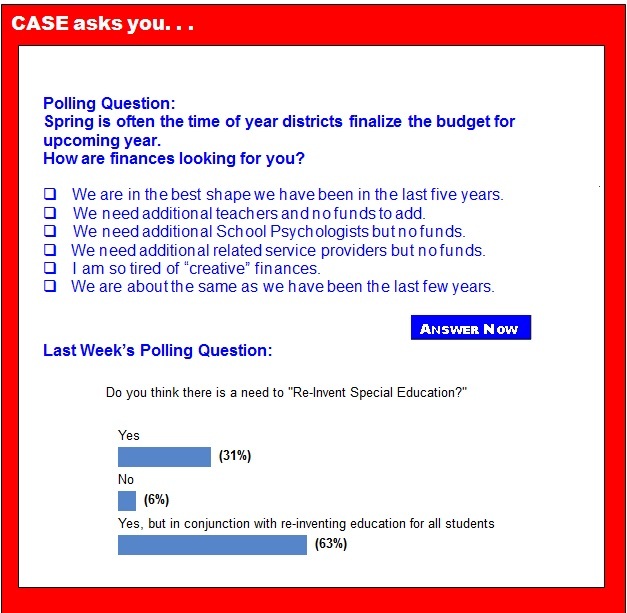 Spring is a very busy time for Special Education Directors and district staff. Between all the annual reviews, last minute transition planning for upcoming graduates, staffing issues — both folks leaving and hiring, and all the other "stuff" that seems to multiply like rabbits in the spring, you have very little time for yourself! Don't let all the "stuff" cause you to forget the April 27 deadline for the call for proposals for the 25th Annual CASE conference! The CALL FOR PROPOSALS for the 25th Annual Fall CASE Conference is now on the CASE website — click here for more information and to submit your proposal on line. The drop dead date for submission is April 27 so don't let it slip up on you! Every year we have people contact us a week after the deadline and we are not able to accommodate them. The conference will be in San Antonio this year November 13-15, 2014 at the Hyatt Regency. This will also be the 25th anniversary of the CASE Fall Conference so we are looking to make it a stellar experience. To do that we need lots of great, evidence based, practical sessions! For job seekers, CASE Career Center is a free service providing access to employers and jobs in education. In addition to posting their resumes, job seekers can browse or view jobs based on the criteria they find matches their goals best. Job seekers can also post confidentially with confidence or search anonymously by creating a Job Agent. Job Agents notify job seekers via email when jobs matching their criteria are posted eliminating the need to visit their online accounts daily to track new postings. Click here to go to the main site to either learn of new jobs, post your resume', or post your positions. There is a modest fee for posting positions on the site but we believe you will have a greater reach with this dedicated career center on our website — click here to become a job poster. It's Not Too Early to be making plans to attend the 12th Annual CASE Educational Legislative Leadership Summit, July 13-16, 2014! Click here to go to registration. This year as every year, is a very important time for CASE to have as many different states represented up on the Hill for our visit on Tuesday, July 15. There are several really important national issues we will be working on in DC this year with our other association partners. Don't miss this great opportunity. And, with a hotel group rate of $149 at the Hilton Old Town, right across from the King Street Metro stop, this might be a great time to do a DC excursion for you and the family! Group rate ends June 17 so click here to make your hotel reservations! Click here for the flyer. As someone who advocates for your students every day, you need to attend CEC's National Legislative Conference and bring your passion to Capitol Hill. What happens when you combine thousands of special educators with over 800 professional development sessions? Learning ... networking ... sharing ... and many stories about students! On April 9, the Federal Register released applications for awards for training and information centers for parents of children with disabilities. The purpose of this program is to fund 24 Parent Training and Information Centers designed to meet the information and training needs of parents of infants, toddlers, children and youth with disabilities, ages birth through 26 and the information and training needs of youth with disabilities living in the States served by the centers. At Miami Carol City Senior High in Florida, a handful of teachers, administrators and coaches are gathered around a heavy wooden table in a conference room dubbed the "War Room," looking through packets of information about several students. Dyslexia is a complicated topic in the state of Kansas. Even though one in five people have been diagnosed with dyslexia, according to the Fundamental Learning Center, Kansas does not recognize it as its own category of learning disability in the school system. "Dyslexia is a learning disability that can hinder a person's ability to read, write, spell and sometimes speak," said Mary Belvin, director of Children Services at the Fundamental Learning Center in Wichita. At Miami Carol City Senior High in Florida, a handful of teachers, administrators and coaches are gathered around a heavy wooden table in a conference room dubbed the "War Room," looking through packets of information about several students. There are others at the table, too: analysts from the group Talent Development Secondary, which monitors student data; City Year, a nonprofit that provides mentors; and Communities in Schools, which connects kids with health care and social services. Researchers at Columbia University report that schoolchildren from three school districts in Maine exposed to arsenic in drinking water experienced declines in intelligence. While earlier studies conducted by the researchers in South Asia (Bangladesh in particular) showed that childhood exposure to arsenic in drinking water is negatively associated with intelligence, this is the first study to examine the issue in the U.S. Findings are reported online in the journal Environmental Health. An education advocacy group representing more than 10 million teachers, principals, administrators, parents and school board members nationwide said policymakers should give states more time to implement the Common Core State Standards and asked for a delay in the accountability measures linked to the aligned tests. The Learning First Alliance — which represents big-name education organizations such as the National PTA, the National School Boards Association and the nation's two largest teacher's unions (the American Federation of Teachers and the National Education Association) — said it would create a website dedicated to highlighting Common Core success stories to serve as a guide for further implementation. Special education resources are in high demand, and while each student with special needs is different, special education teachers and support staff benefit from sharing best practices and strategies. Technology enables global communication, and this is especially true for educators — special education teachers from across the country can collaborate online to share their favorite tools and interventions. American teachers feel stressed out and insignificant, and it may be impacting students' educations. Gallup's State Of America's Schools Report, released Wednesday, says nearly 70 percent of K–12 teachers surveyed in a 2012 poll do not feel engaged in their work. The study said they are likely to spread their negative attitudes to co-workers and devote minimal discretionary effort to their jobs. At the same time, nearly half of teachers reported feeling daily stress. When compared to 12 other occupational groups, teachers were least likely to report feeling like their "opinions seem to count" at work. The survey also found, however, that teachers tend to be satisfied with their lives overall. Once it's begun, you can't fully separate the person from the task. When the artist is painting, the painter and the act of painting become a single "thing." The emerging artwork becomes a part of it all, too. As a teacher, your "self" is embedded within your teaching — which is how it goes from a job to a craft. The learning results are yours. You probably call those young people in the classroom "your" students. The same goes for students as well. There is a pleasing kind of string between the eight-year-old playing Minecraft and his or her digital creation. This is the magic of doing. In the most recent Program for International Student Assessment, commonly known as PISA, students in the United States ranked 26th out of 34 countries in mathematics. On the surface, it would seem that we’re a nation of math dullards; simply no good at the subject. But a spate of new research suggests that we may be underestimating our students, especially the youngest ones, in terms of their ability to think about numbers.